Allium 'Purple Sensation' has vivid balls of purple flowers on tall stems. It attracts butterflies and beneficial insects at a time when there are few other flowers in the garden. I love the stunning color of Allium 'Purple Sensation' so much that I planted it on both sides of the path in my old-fashioned rose garden. It's a joy to walk along the path in late spring to early summer. 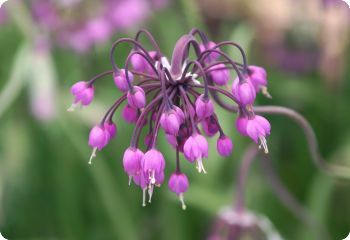 Also known as Allium hollandicum 'Purple Sensation'. Hardy in zones 3-9. Requires a long period of cold-moist stratification. Allium, also known as flowering onion, is a perennial with clusters of small flowers on top of the stems. Some allium species require cold-moist stratification. Sow the seeds outdoors in the fall. Barely cover with soil. Full sun. 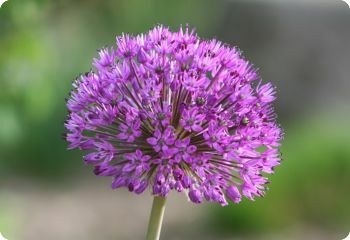 Allium cernuum blooms in midsummer with nodding clusters of purplish-pink flowers. It's a native wildflower and a terrific self-sower. It spreads to form a dense patch, which makes it an effective groundcover. Allium cernuum tolerates a wide range of conditions from sandy or rocky soil to damp clay. It likes full sun or part shade, and it's relatively easy to grow. Sow the seeds outdoors in fall, or give them 8 weeks cold-moist stratification before sowing indoors in spring. Hardy in zones 3-10. Allium christophii is one of my favorite alliums. 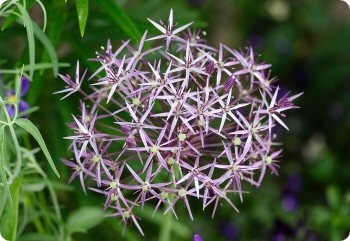 The large, round balls of star-shaped flowers bloom in early summer in a light shade of lavender-mauve. They look good with columbine, which blooms at the same time. Sow the seeds outdoors in fall, or give them 8 weeks cold-moist stratification before sowing indoors in spring. Also known as Allium albopilosum. Deer resistant. Hardy in zones 4-9. Garlic Chives are tall and upright with wide, flat leaves. They have a strong garlic flavor that is useful in the kitchen, and they make great companion plants in organic gardens. They repel aphids, and the flowers attract bees, butterflies and beneficial insects. 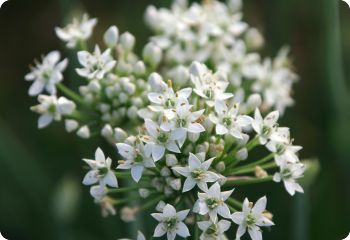 Allium tuberosum produces clusters of starry white flowers in late August. Years ago, I read that the famous English plantsman, Christopher Lloyd, grew them in his garden to come up through The Fairy rose. So I planted garlic chives around my Portmeiron rose. They make a great pair! Sow the seeds outdoors in spring. Or start indoors 6-8 weeks before the last frost date. Self-sows excessively unless deadheaded. Hardy in zones 3-9. Common Chives are not just for eating. The pretty, purple flowers attract bees, butterflies and beneficial insects in late spring. The bushy plants can be used to create a low-growing hedge. 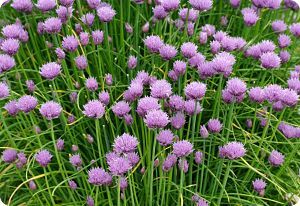 Common Chives are a great addition to the herb garden or the flower garden. Sow the seeds outdoors in spring. Or start indoors 6-8 weeks before the last frost date. Hardy in zones 3-9.